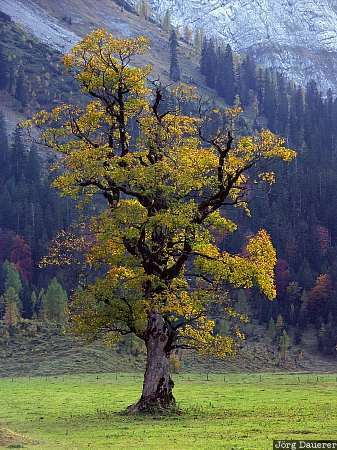 A lone tree with yellow autumn leaves in Ahornboden, a beautiful valley in the Karwendel mountains. Ahornboden is in north of the state (Bundesland) of Tyrol (Tirol) in the west of Austria. This photo was taken on a sunny day in late October of 2004. This photo is part of the exhibition Autumn (October 2006). This photo was taken with a digital camera.